So what happened, and how did we get here? The original plan was this: 3D earth was destined to experience a natural, organic ascension process at the end of this current time cycle of approximately 26,500 years – some say at around 21st December 2012, but more likely sometime between 2017 and 2020. This ascension process was to involve all of humanity – the earth and all of its kingdoms (plants, animal, mineral, Devic etc). There would be a change in frequency and effectively a change in the focus of our consciousness from one reality to another. If all had gone to plan, we would have naturally and organically ascended into the next dimensional space, which we know as 5D – in other words, we would have made a full dimensional shift. As we did so, we would have reclaimed the parts of our spiritual identity that exist at 4D, 5D and 6D, which would see us come more and more into the truth of who we really are, as sovereign and free beings. Why would we go to 5D and not 4D? Because the 4D astral plane is the level of existence most people pass into when they drop their physical body, and it is from here that most will have reincarnated back into another earthly life – it is not an ascension point. Rather, it is a dimensional band that holds the collective unconscious mind of humanity – all of our pain, trauma, fear and anger as well as soul-based trauma, the energy of debauched sexual dreams and fantasies (which is satanic energy). It also holds the soul bodies of people who have passed, and those who have become trapped as lost souls or clones; it holds the soulless and “dementor” types of entities that feed off the energy of 3D humans. There are also some 4D angelic energies, some ETs and many tricksters and holographic inserts. Basically it is not an enlightened plane of existence and is not a place that we would want to hang around in for too long if we really understood what exists there – but it is usually the first dimensional level beyond the physical plane that we become aware of when we begin to open up spiritually. It can feel like an exciting place to explore beyond this physical reality. At 4D we are able to access the “bliss states” that are common through tantric practices, trance dance, chanting and so on – those feel good states where there is nothing but love. The more gullible among us believe they have reached high states of consciousness due to these feelings of euphoria. This is actually a type of “complacency” implant designed for emotional manipulation. It is important to understand that the 4D level is where the artificial technology is inserted to create the False Ascension Matrix, even though it is controlled from the higher dimensions of 5D. The False Ascension Matrix actually controls 4D, 5D and 6D levels of the planet and if we are aligned to it, it controls those levels of our own body too. Technology exists there that blocks off our natural spiritual development/ascension process by blocking the body at a point between the solar plexus and the heart on the hara line. This point needs to be open to receive the spiritual energies of the soul body as it comes in through the spiritual awakening process, but if it cannot do that the soul may be captured and harvested to be used by the negative agenda and sometimes to create a clone which may be used at a later date by the grey aliens. This false software looks and feels “normal” – but it is anything but normal. Being in the False Ascension Matrix is akin to being in a bubble, or a cocoon of energy that traps the spiritual seeker; we may pass through these levels on our spiritual awakening journey, for there is much to be learned there, but anyone who spends too long may be taken out of their natural timeline and left stranded in a timeline where growth is capped. The problem is that they will think they’re making great progress, because it feels so good in this bubble, and they will not want to leave. I have witnessed a great many people – friends, colleagues and students – become completely trapped within this matrix. Their energy field becomes enmeshed in 5D or is siphoned at 4D astral levels. And it is really difficult to unplug them from this matrix, because of the mind control that exists there. Unfortunately they believe that they are really waking up and progressing, and so they are completely unwilling to hear anything that they perceive to be “negative”. They have bought into the myth that there is only light and love at 5D. They think they are safe, and that they are growing. But nothing could be further from the truth. There are some who do recognize that they are stuck, but don’t know how to escape, as they don’t know what’s happening in their own energy field. Most people though, don’t know that they’re stuck, nor do they understand the frequency fields they are tapping into that keep them stuck when they do their tarot readings, channellings, chanting, reiki healing and so on. The negative agenda’s plan is to control humanity and prevent us from truly awakening, and so it makes an awful lot of sense that if they can gain control of the 5th dimension, they can control the outcome of those awakening to that level. But it gets worse. The 5th dimensional timelines have been hijacked by those aligned to a negative agenda; human souls are being actively recruited and risk losing control of their consciousness simply by willingly yet unwittingly being aligned to that (false) timeline. Therefore those humans who are gearing up for a 5D ascension believe it will be one of love and light – but in fact they will find themselves in a matrix that takes over their life force and consciousness, and they will no longer be able to determine what is real and what is not. Even more horribly, once taken over like this, they will eventually provide bodies for ET beings to use in order to gain entry to this planet in a physical form. There are a number of ET groups working in this negative agenda, however for simplicity, and for the purposes of this article, let’s say that none of the factions that have control of 5D and 7D parallel earth timelines are your friends. They are not going to encourage you towards your personal sovereignty, freedom and liberation, however much they may spout this in their channellings. At this time on planet earth we are experiencing a dimensional shift – this is written in Universal law and there is nothing the negative agenda can really do about it, other than to create artificial timelines that they themselves control. They do everything they can to encourage humanity to step on up, ladies and gentlemen, into a shiny new level of awakening that will feel absolutely wonderful! So what does the False Ascension Matrix look like? Earth history has been distorted and mostly hidden from us, and it’s not what we think it is. From time immemorial the negatives have been at play here, and through the use of reversal coding and manipulation, most, if not all of what we thought was real in terms of esoteric or occult teachings or mystery school teachings, are not truly aligned to God-source. The Annunaki (an alien race) have controlled the teachings of Thoth and by extension the Mystery School teachings related to Thoth, including certain factions of the Melchizadeks, the Maitreya teachings, Archangels, Ascended Masters, Aleister Crowley, tarot schools and basically anything that represents an external (from Self) God, Angel, Archangel, Channel or ET group. This also includes many of the guru/disciple programs run through ashrams and many of the healing modalities that align to off-planet energies. ET groups and secret government/Illuminati have also infiltrated all of the organised religions on planet earth. Many “New Age” teachings draw on ancient symbolism, invocations and rituals – much of which is reverse-coded to siphon energy from the user. Some that teach external Merkabah mechanics and offer rapid acceleration techniques, DNA template activations and the like may actually be causing damage to a person’s lightbody and DNA, which also then allows for siphoning of energy and consciousness. It can be really confusing to sort through all of the numerous belief systems and modalities that are available to us in this highly profitable “spiritual industry”. Our ascension was designed to be a natural organic process. Through the use of mind control technology and psychotronics, disinformation and alien implants (to create non-human behavior patterns) many humans are losing their way and are only too happy to follow a belief system or modality that promises them salvation, safety and peace. At this time, many people are even looking towards ETs to come and help us or to take away all the bad people in government and make it all better for us here on earth. These people are unwittingly giving their power away to a group of ETs that they don’t even know – the very same group that have manipulated the timefields to align their own negative agenda and who have carefully selected gullible speakers/channels as their hosts and mouthpieces on earth. These are often the hybrids and walk ins. There is a reason they are not born on earth at this time – they are not your friends. There are several artificial timelines available to us that we may choose to participate with, and one example is “The Armageddon Timeline”. This one includes terrorist threats, disease epidemics, food shortages, global warming, financial collapse and so on – anything that is designed to put us into fear, as this is the low frequency the negative agenda feeds off. We can see this all around us in this chaotic time on the planet. Unfortunately the Armageddon timeline appears to be one that our Government (in fact, most Governments on planet earth) are trying to promote. When we are in a state of fear, the natural default is survival mode. This takes us into our “reptilian brain”, which clearly is not the most conscious part of us. It’s where we are less likely to feel connected to God/Spirit, or experience any intuitive or creative thoughts. In this state we are more likely to follow the crowd and relinquish our ability to think freely and consciously. It’s much easier to manage an obedient crowd, which is exactly what the negative agenda wants: compliant people; enslaved and controllable humans. 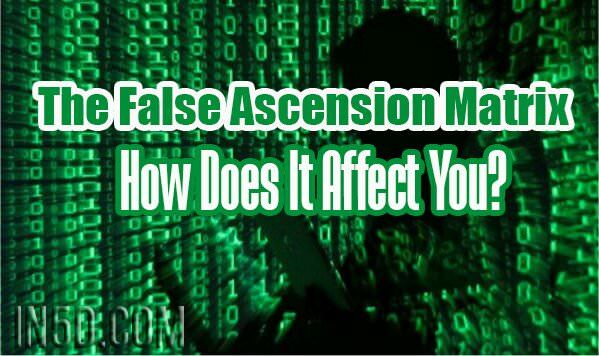 How do I get out of the False Ascension Matrix? Let go of anything of the mind – let go of the systems and rituals, and come back into your heart, come back into Self – the inner sanctum – the God Self. Let your only guidance come from the God within – put down your ancient books and cards. You need no external physical tools to connect with God. Only by reclaiming our spiritual identity can we remember our true Divinity. There is much work to be done on ourselves so that we may consciously navigate the timelines of the 5D false ascension matrices. We must pay attention now in order to rise beyond all of these falsities, in order to access multidimensional levels of self and align to the natural organic timelines as a Divine Ascending Human as God intended. Tags: 5th dimension, annunaki, ascension process, dimensional shift, dna, False Ascension Matrix, The False Ascension Matrix – How Does It Affect You?